We offer grooming Tuesdays, Thursdays andFridays. 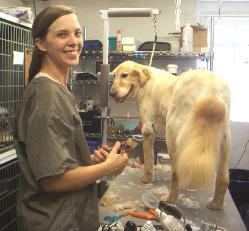 Jenny, our groomer, takesgreat care and time in making sure your pet looks and feels wonderful. All of our grooms are dropped off between 7:30 to 8:30 am in the morning and are ready to go home early in the afternoon. All dogs are required to be current on Rabies, Distemper, and Bordetella (Kennel Cough) vaccines, in order to be dropped off for grooming. All cats must be current on Rabies & feline distemper If they are current with these vaccinations with another clinic, please bring copies for our records. If these vaccines are not current, they will be given upon arrival. It's important to keep your pet and all the other pets in our salon healthy!! We start with a massaging bath that separates your pet's old coat from the new and stimulates your pet's hair follicles. Then we apply the Furminator deShedding solution, an all natural solution specially formulated to help remove the loose hair. Next we use a high velocity dryer to separate and eliminate the excess coat and loose hair. The final step is to use the Furminator tool all over your pets body to remove any remaining loose hair. Please call today to schedule an appointment for a Shedless Treatment!! Please note that this treatment does NOT totally prevent your dog or cat from shedding, but instead greatly reduces the amount of hair that is being shed throughout your home.